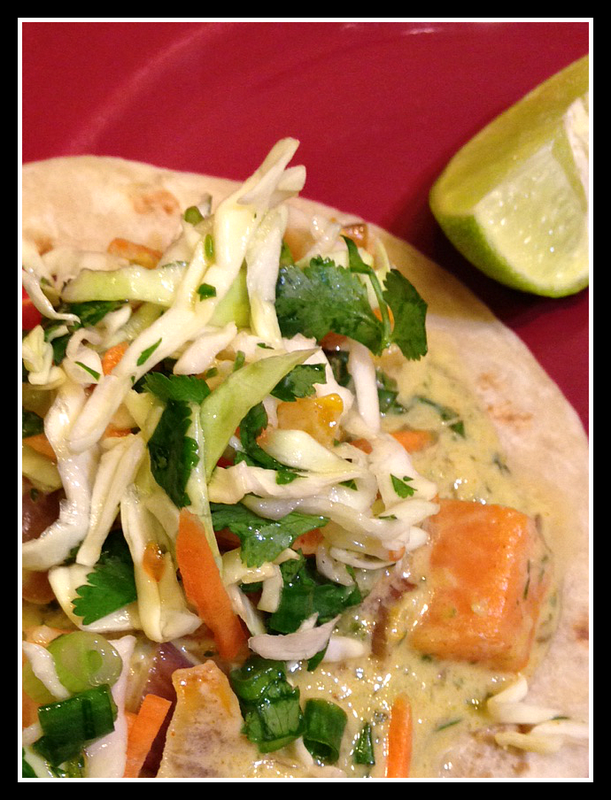 I was in the mood for some vegetarian tacos on the night that I made my fiftieth recipe! I've featured lots of vegetables so far - mushrooms, potatoes, spaghetti squash, calabacitas . . . I was leaning toward sweet potatoes for this one. I knew it would be a challenge. Steve's not a huge fan of sweet potatoes, though he'll usually try them. I did make breakfast tacos with sweet potato hash a few months ago: http://www.arizonarenaissancewoman.com/2015/10/22-breakfast-tacos-with-roasted-sweet.html. Those went over all right. Kind of. :) I decided to try again! I was also in the mood for Thai food - green curry, specifically. One challenge to making Thai food in my town is our limited number of grocery options. We've got a few large supermarket chains, but they don't often carry specialty items. Coconut milk? Yes. Thai chiles? Usually. Lemongrass? Sometimes. Kaffir lime leaves or galangal? No. Never. 1. 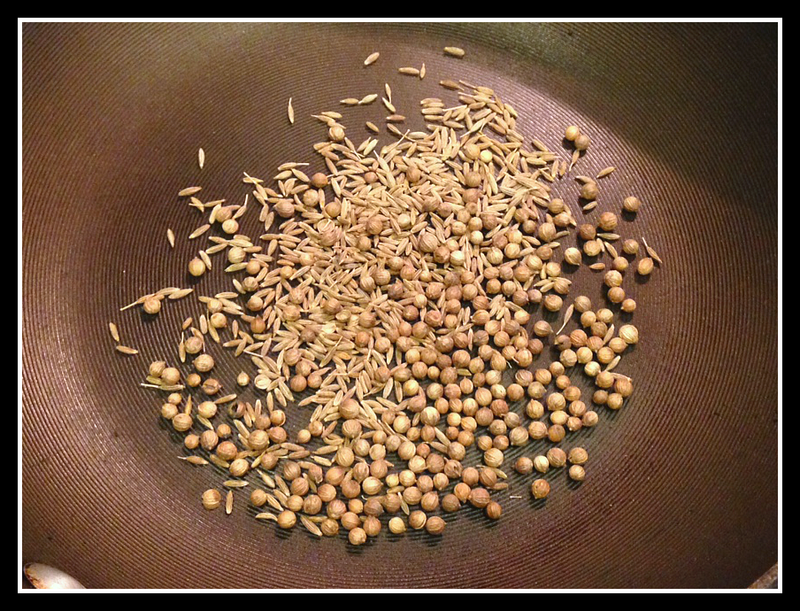 Toast the spices: Place the coriander and cumin seeds in a small skillet. Heat over medium heat until fragrant and lightly toasted but not burned, about 4 to 5 minutes. Set aside to cool. 3. 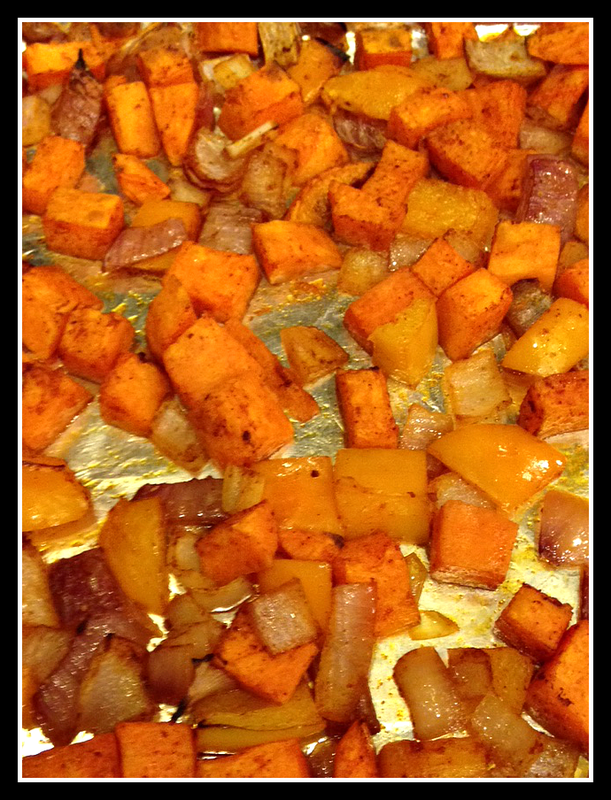 Roast the vegetables: Toss the red pepper, sweet potato, and onion with the paprika, salt, and canola oil. Place on a foil-lined baking sheet and roast in a 400 degree oven for about 15 minutes or until the vegetables are tender and somewhat browned. Remove from the oven and set aside. 4. While the vegetables are roasting, finish the sauce: Heat the 1 tbsp. 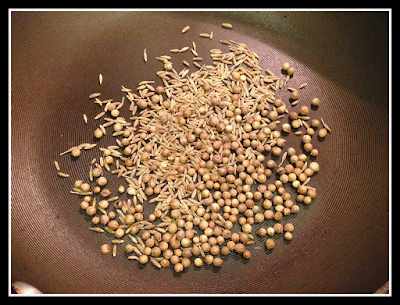 of canola oil in medium skillet over medium-low heat. 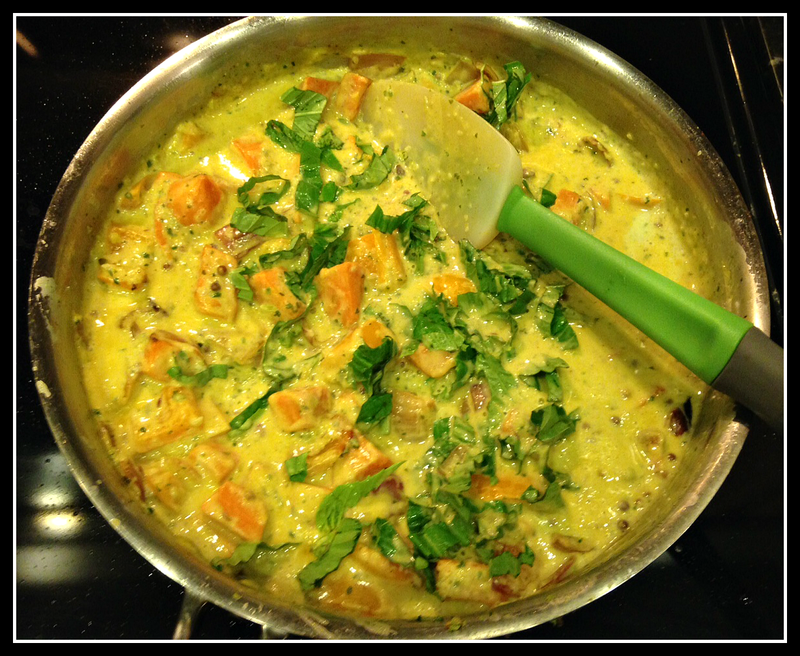 Add the green curry mixture and cook and stir for a minute or two. Add the coconut milk and stir to combine. Turn the heat to very low and simmer for about 10 minutes or so. Keep warm. 5. 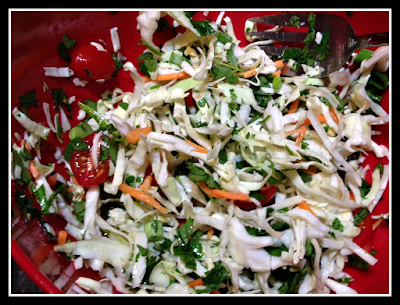 While the sauce is simmering, make the slaw: Place all slaw ingredients in a medium bowl and toss to combine. Set aside. 6. Add the roasted vegetables to the sauce. 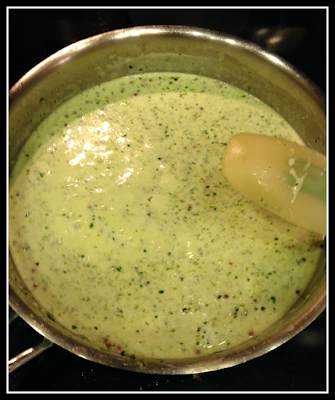 If the vegetables and/or sauce have cooled at all, you can turn the heat back on and get it back to a simmer. Add the sliced basil and stir. Taste and adjust seasonings. 7. 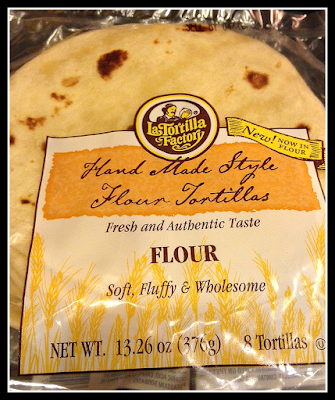 Prepare the tortillas to your liking: I prefer to heat mine in a dry cast iron skillet over medium high heat for about 30 seconds to a minute on each side. After each one is done, I place it on the foil and immediately start the next one. I stack them on top of one another as I work. When I'm done with the whole batch, I wrap them completely in the foil. You can keep them warm in a 250 degree oven if you wish, but I didn't bother as this was my last step! 8. 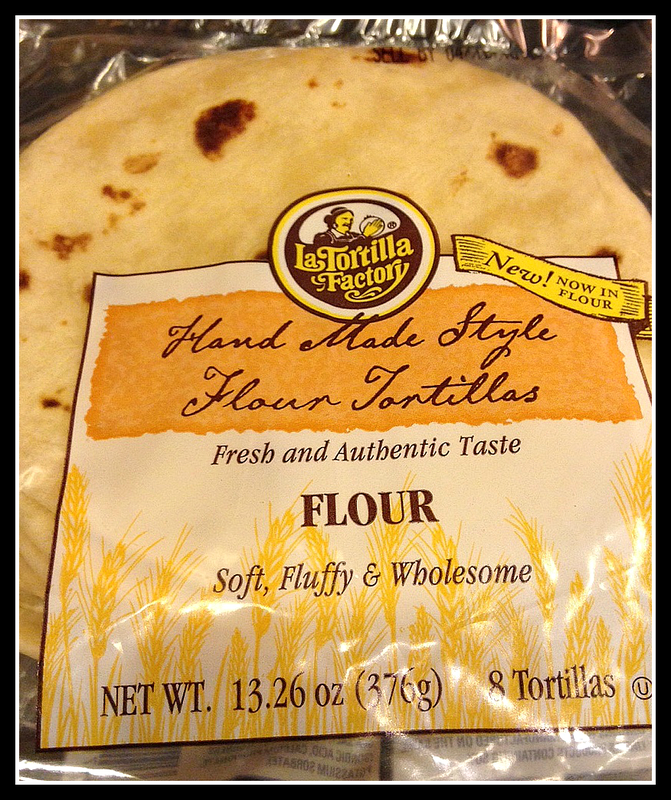 When all of the components are ready, assemble the tacos: For each taco, place a tortilla on a plate. 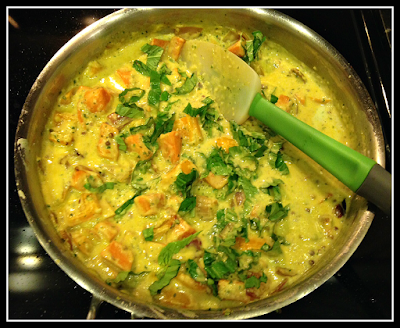 Top with a generous amount of the sweet potato curry mixture. Spoon on some of the slaw. 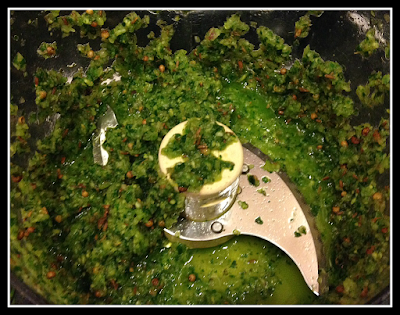 Garnish with a squeeze or two of lime. Enjoy! Well. At our house, we had varied opinions about these tacos. Actually, not really. There are two of us, so we had two opinions. 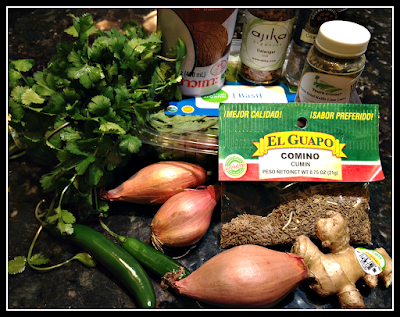 I thought they were exotically tasty, just as I had envisioned, though there are a few tweaks that I would make next time. These did not win Steve over to sweet potatoes. He is still not a fan. Sigh. Ha ha. I tried. 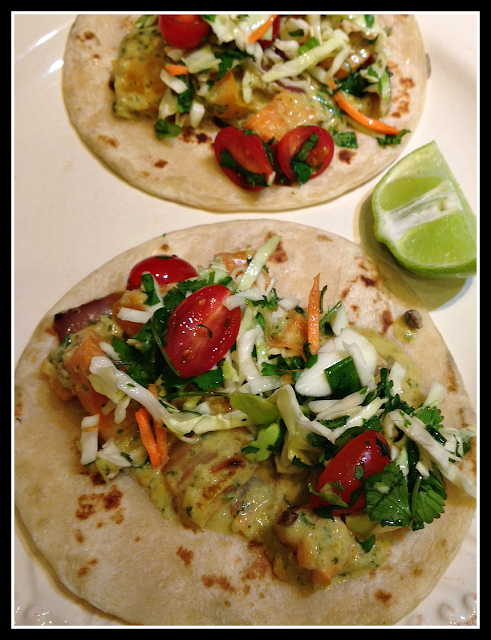 Though unusual, these tacos are actually pretty good if you like the ingredients. If I had make them with chicken, they probably would have gone over a little bit better! In short, they didn't quite work for him. So . . . what would I tweak? Well . . . The sauce was pretty good! For some reason, I decided to use the food processor instead of the blender to make the curry paste mixture. Yeah, that didn't quite cut it. With the whole cumin and coriander seeds and the dried galangal (which was a bit woody), a blender would have been a much better choice. Though the food processor worked out OK - the texture of the sauce was just a bit rustic! The filling is pretty saucy. I used a thick flour tortilla (the same one that I used in my Chili Con Carne tacos - http://www.arizonarenaissancewoman.com/2016/02/46-chili-con-carne-tacos.html) and that was definitely a good call. A thin tortilla might prove slightly frustrating in this situation. Well - by now, we all know the drill. Would this recipe have made more sense just spooned over rice instead of wrapped in a tortilla? Ha ha. Maybe. But then, we wouldn't have The Taco Project, would we? As I said in the beginning, I'll be honest about how these turn out. These were honestly pretty good. And weird. And interesting. And not the best choice for someone with negatively ambivalent feelings about sweet potatoes! Feel free to comment on this recipe! Did you try the tacos? What did you think? How about the dried galangal and kaffir lime leaf? Would you give those a shot?